Anna is upset in the General Hospital spoilers. 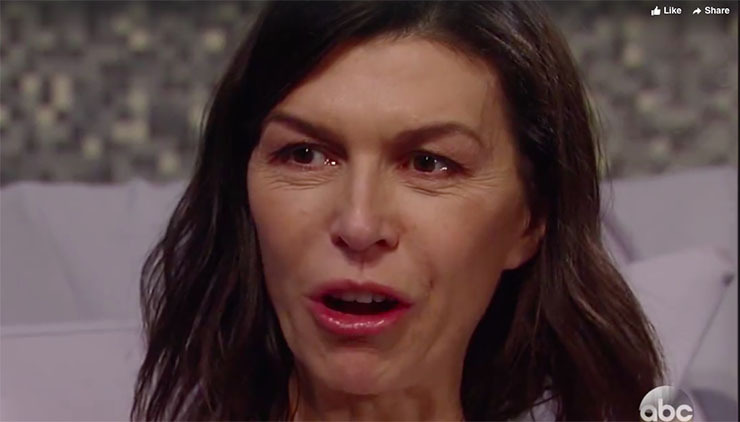 The General Hospital spoilers for Monday, February 20th, reveal that Robin is there for her mom, while Carly makes exciting plans. Monday Anna (Finola Hughes) worries that everything that’s happened including and since she passed out at Wyndermere is evidence that she’s going to get some very bad health news soon. She’s trying not to jump to conclusions, she tells a teary-eyed Robin (Kimberly McCullough). But who can blame her? It’s not easy to wait for test results that could tell you how the rest of our life will play out. Being an excellent doctor, Griffin (Matt Cohen) has approached Anna’s care with the utmost professionalism. But he can’t help caring about his first friend in Port Charles. He is anxious as he gets the results of Anna’s biopsy and looks at them. Carly (Laura Wright) makes arrangements for a romantic escape for her and Sonny (Maurice Benard). They need it after all they’ve been through lately. Hopefully, she’ll make the arrangements herself and not involve Nelle (Chloe Lanier), who’d likely show up with the news that she and Sonny “slept together” at the most inopportune time. Ned (Wally Kurth), meanwhile, makes a decision that could change the course of his life. We hope Olivia (Lisa LoCicero) doesn’t read these spoilers, because that might tip her off! On the other hand, perhaps she wants to be prepared for news that could very well involve her too. Previous ArticleDays of Our Lives Spoilers: Monday, February 20th: Help! They Need Somebody!